About a month ago, things at Mike’s work started getting really crazy. There was talk of layoffs, people getting fired, etc . It made things around here very tense and I don’t do well when there is tension in the house. As Mike would leave each day for work, I would pray Lord just be with him today… keep him focused. Late one night after a particularly stressfull shift at work… well… I sort of lost my cool. Now keep in mind that Mike is a wonderful God-fearing man. But… the “old” mike shows up from time to time. I didn’t know him then, but from what I hear I wouldn’t have liked him very much. As asked him straight out if he believed in God, he said yes you know I do. Do you believe in the Bible as the word of God… again, yes of course I do. So then I started spouting out scripture about being anxious and that he needed to stand on that scripture and believe. I could see that he was thinking about what I had said. So then next day he heads off to work and I have a thought. I decided that I was going to put up the scripture on the bathroom mirror. Well needless to say, he laughed at what he saw. Then he stood there and read it over and over. 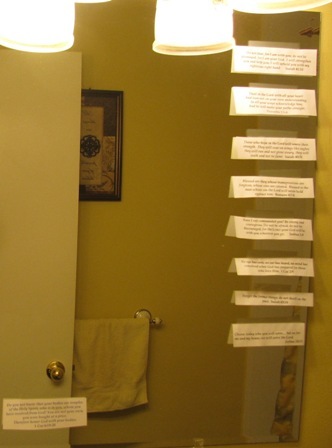 As you can see from the picture, there have been so many scriptures added to our bathroom mirror. I find it comforting. When there is something crazy going on around here. I go for the scripture that suits whatever dilema we’re facing. So today’s scripture just went up. We’re dealing with a medical issue here. Mike has been told that he has the beginnings of emphysema! I am soooo not a happy woman. (In other posts, you’ll learn that I lost my former husband to lung cancer). Mike and I have had the discussion about his body is the temple of the Holy Spirit and he just kind of gives me the blank stare. We’ll, here you go… I didn’t say it… GOD DID! I’ll let you know how that all works out.